The San Diego Workforce Partnership (SDWP) is seeking a qualified vendor to provide managed services support. Further details are discussed in the RFP. SDWP must receive proposals no later than 3 p.m. PST, Friday April 13, 2018. PDF versions of written and signed proposals should be sent to procurement@workforce.org with the title of “IT Managed Services — [name of bidder] response”. Recording of the orientation available here. What is the Active Directory setup? SDWP is operating a hybrid on-premise-cloud Active Directory system. On premise at SDWP there are two Active Directory servers, both virtual machines (Windows 2008 R2 servers). Additionally there is another virtual machine which runs Azure Active Directory Synchronization Services. What is the average ticket volumne? 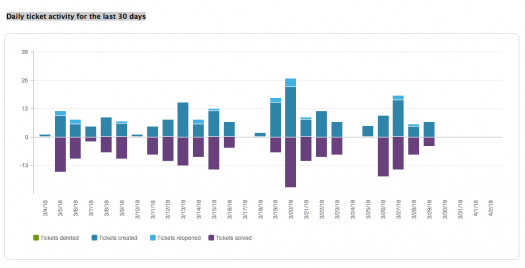 How many new tickets are created monthly? What is the average reply time? What are the common types of tickets? Common tickets include access requests to various systems, equipment check-out, equipment assignment/re-assignment for onboarding and off boarding, equipment moves (coordinated with facilities team), equipment purchase, connection issues, reports of SPAM, batteries for mice, issues printing. How many physical servers NOT HOSTING virtual servers? There are a total of 3 working host servers, which contain 34 guests (virtual servers)- fully virtualized using VMWare ESXi operated from vCenter. Number of Windows workstations USED to connect to Citrix? Number of Windows workstations NOT USED to connect to Citrix? All users/machines have access to Citrix, including those at HQ with MAC machines, but not all connect to Citrix regularly. SDWP has 150 Citrix licenses but normally averages 80-90 active users. Majority of the users are those at the Job Centers. How does SDWP keep all 234 desktops and 28 laptops patched and updated currently? SDWP has baseline images for the machines. JAMF is used for patching/updating/deploying software to MACs. SDWP uses WSUS and Deep Freeze to push updates to PCs. How many of the 234 computers are used by the public? Aproximately 180 computers are accessible to the public, either in a resource room or lab/classroom. Does SDWP lock down the workstations / laptops to only connect to Citrix farm or do the users have a requirement to use locally install applications, i.e. Word, Excel, Adobe, etc.? Users can access the web outside of Citrix but are not able to install other programs. What is the current backup solution and how much data is being backed up to the existing SAN? SDWP uses a Tegile T4100 with all flash drive array. Backups are run nightly. SDWP estimates that the size of the data backup is 5-6 terabytes. What are the existing firewalls at each location? The current network setup is a hub and spoke model. Each job center must connect through the HQ location to access the internet. At the HQ location there are three firewalls: 1 Cisco (primary), 1 Cisco (fail over), 1 Fortigate (used for web filter). On the webinar there was a discussion around two desktop techs on-site that are no longer with SDWP, to ensure there is a level ground for pricing do you want the two techs on-site or can everything be remote ? or should we provide two options for pricing? Respondents should provide multiple pricing models. Please also note instructions in section 2.3 Budget which state “Budget should include pricing for blended and full support models; note that SDWP currently has one IT manager and one network technician. Please clearly state which model(s) you can provide.” Additionally, while SDWP understands that a good deal of network administration could be performed offsite, SDWP does expect that some level of onsite support would be required for things such as issuance of equipment and equipment repairs. This onsite work could be performed by either respondent staff or SDWP staff depending on the recommended model (blended vs full suport). On the tools and ticketing system, is SDWP leveraging the MS provider’s tool or will SDWP still utilize tools they have in place or will this be a hybrid solution? SDWP is open to considering the best tool(s) to meet our business needs taking into consideration a) existing contracts and their termination dates/clauses b) SDWP’s procurement and compliance processes, as required by the terms of our grants c) SDWP’s ability to negotiate non-profit rates for hardware/software. If respondent is recommending new software as part of the proposal, respondent should clearly indicate as such and specify what portion of proposal budget is software related. Please note that software purchase/leases are subject to State approval in most cases and thus changes will need to be considered on a case by case basis. What maintenance windows are granted for proactive upgrades to network, security, systems up keep ? Is this weekly, monthly or quarterly? Respondent should recommend maitenance windows based on industry best practice. There was not a lot of mention on security. Should security be proposed in the managed services for monitoring and reacting to threat vulnerabilities ? Yes, monitoring and incident response should be included. If respondent is recommending new software for monitoring and incident response as part of the proposal, respondent should clearly indicate as such and specify what portion of proposal budget is software related. Please note that software purchase/leases are subject to State approval in most cases and thus changes will need to be considered on a case by case basis. What is the budget for managed services? SDWP is looking for the best solution to fit our needs taking into consideration the size and scope of our organization. SDWP total annual budget is approximately 35M. Contracts which exceed 100K per program year generally require approval by the board.